You'll be £4.99 closer to your next £10.00 credit when you purchase The Greater Game. What's this? Amongst the many thousands of lives tragically cut short in the First World War were hundreds of young men who had athletic and sporting promise. This book studies fourteen professional sportsmen who gave their lives in that most vicious of conflicts. It also looks deeper into the impact that the War had on professional sport in Britain and the raising of sportsman-specific Pals units that enabled a number of these men to serve side-by-side in the trenches of France and Flanders. Their intriguing yet tragic stories are drawn from the ranks of professional footballers, international rugby stars, Wimbledon champions, Olympic gold medallists, cricketing heroes, golfing professionals, a member of the Ice Hockey Hall of Fame and a Tour de France winner of the countries fighting for the Allied cause. Once in uniform they became soldiers, sailors and airmen and as vulnerable and mortal as any of their comrades-in-arms. Whilst some were awarded Britain's highest military accolade, the Victoria Cross, many others lay in unmarked graves and are today listed on memorials to the missing. All left their lives of fame, wealth and security to play 'the Greater Game' overseas and pay the ultimate price on the field of battle. In addition to detailing the sporting achievements of these men this book delves into their military experiences, their battles are studied and footsteps are followed across the old front line. 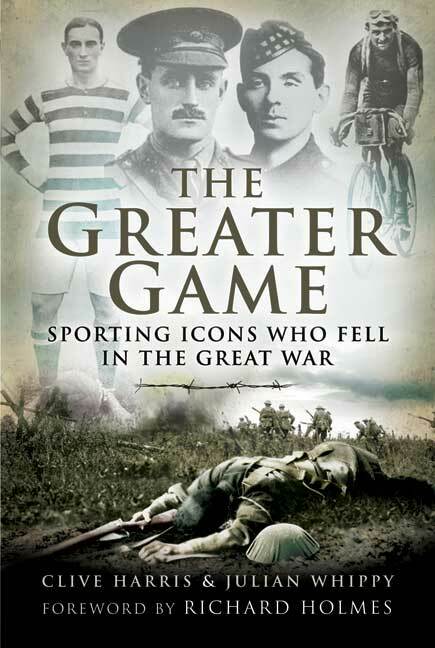 The Greater Game - Sporting Icons who Fell in The Great War will appeal to sporting and military enthusiasts alike whilst providing a fascinating and long overdue tribute to our true sporting heroes of ninety years ago. This book is full of such inspirational stories of sport and war, including that of the Heart of Midlothian, McCrae's Battalion, boxers of the Great War, and Tennis star and 'Heart Throb' Tony Wilding. Each story is developed in great detail such as that of Bell. The photographs as humbling reminding the reader that these men were 'heroes' in a different field before they even went to war. These the likes of Frank McGee, who was wounded at Ypres and who fell at Courcelette, standing in the pre-war Ottawa Silver Seven aside. and the authors themselves standing at 'Bells Redoubt', Contalmaison, on the Somme. The book reminds us that each personal story provides its own testimony to the experience of war, and also how much was lost in 1914-18. This is one of the most interesting books that has been published that covers the period of the Great War, especially now as there is nobody left to tell the stories and remind us of those who paid the ulitmate price. This book looks at that through the eyes of sporting icons, covering a wide range of sports, that brings home how young some were and what we lost. The book opens with Ronald Poulton Palmer a Rugby Union player, England international and if he had lived would have gone on to run Huntley Palmer biscuits. Poulton Palmer was not just any rugby player but one of England’s most famous of the period, who had enjoyed dominance on the pitch especially against the French. One of my favoutite chapters is the one that covers Alex ‘Sandy’ Turnbull, a footballer who found fame at Manchester City, then after scandal, a ban was to lead him to play for Manchester United. A man that had won the FA Cup with Manchester City and then did the same at United, where he also won a couple of league championships. It covers how he came down from a mining town in Scotland, to play in what is now the capital of English football. There is another chapter that covers how Association Football went to war and covers the footballing VC Donald Simpsell Bell, a man who had played for Newcastle and Bradford Park Avenue. There is also a chapter on Jack Harrision who played Rugby League for Hull and who today has a statue outside the KC Stadium in Hull. In this book we learn about the tennis player who went to war, the Aussie Rules player killed in action as well as the Sportsmen of France who paid the supreme price. We get a look at the boxers who went to war and those who could not beat the final count. The rowers who did great things for their sport but who were not to return. The Sporting Battalions that were raised and the men in them that answered the call of their nation such as the 13th Rifle Brigade and the famous Footballers Batallion the 17th and 23rd Batalions Middlesex Regiment. We also have a chapter on the Hearts of Midlothian team who signed up enmass and many were to die on the first day of the Battle of the Somme, comrades and friends until the end. Clive Harris and Julian Whippy have researched and written an excellent book that brings home how young people were who died. That not only did the ordinary man in the street fight but they were fighting alongside their sporting heroes . These are two men as battlefield tour guides who have brought their knowledge of the era to bear on this book and written something that will stand the test of time. The authors have taken advantage of the much improved access to information that the release of soldiers documents and the internet have provided in recent years, to compile authoritative, absorbing stories that are full of interest. The book repays reading and is good value for money. Clive Harris is a full time battlefield guide and lover of London. His previous books include Walking the London Blitz and The Greater Game – Sporting Icons Who Fell in the Great War. He lives in Hertfordshire and is a member of the Guild Battlefield Guides.